Every detail counts when you communicate with your players! I got an e-mail from bwin (this used to be linked bwin.com but bwin.party asked me to remove the link) yesterday a few hours after I wrote my blog post about how important it is to pay attention to details. I haven’t been playing on bwin (this used to be linked bwin.com but bwin.party asked me to remove the link) for a while so it was probably a re-activation email I got. In the e-mail bwin (this used to be linked bwin.com but bwin.party asked me to remove the link) offered me a poker bonus which sounded pretty interesting. But I was really surprised when I read the bottom part of the e-mail. Image 1. The bottom part of the e-mail from bwin. This was very strange since I am already a member on b’inside and have been for a few years. bwin (this used to be linked bwin.com but bwin.party asked me to remove the link) is one of the biggest players in the igaming community and in my experience they pay attention to details. But in this case they didn’t. 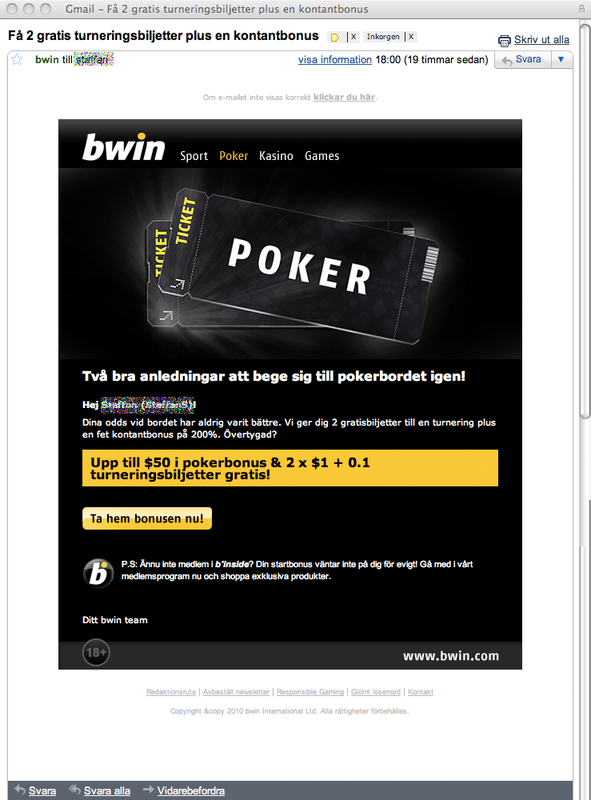 It ended up with me not going to bwin.com (this used to be linked bwin.com but bwin.party asked me to remove the link) claiming my bonus, insted I went and played poker at a different site.